I love the idea of a family tradition. I’ve successfully introduced the homemade afternoon tea for Mother’s Day, we’ve clung on to the traditional Sunday roast, I’m determined to continue my annual pilgrimage to Coventry for my friend Lucy’s birthday. And now I’m working on Christmas. As a child we had a wonderful fabric, Christmas tree shaped advent calendar which Mama filled with chocolate coins and Mars Celebrations. Of course we always swapped them around- who wants a boring mars bar when you can have a heavenly bounty bar? 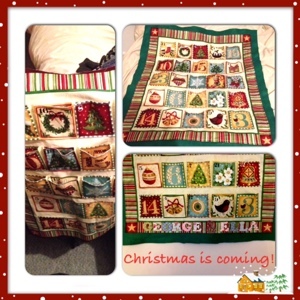 I had thought about making one but it wasn’t until I saw a roll of delicious advent calendar fabric in Liberty’s that I got really keen about the idea. I whipped this up in about 2 hours. I think the looming deadline helped! I mounted it on green felt and stabilised it using an old wire coat hanger (cheeky upcycle). I bought some wooden, fabric covered letters from The Oak Room a few weeks ago and this just seemed the perfect use for them. I’m so, so pleased with how it turned out. I left it up to the boy to fill it with mini nail varnishes for Ella and Matchbox cars for George.